While it rarely gets cold enough for a winter coat in Florida, there are a few times a year where the temperature drops unseasonably low for the sunshine state. One of these times will happen this weekend. Forget about 80 degree weather in December. This weekend, the lows are expected to be in the high thirties and low forties and the high will not get above 68 degrees. You better believe for Florida natives- this is grounds for a thicker jacket, especially for kids. Put the coat on your child, sit them in the child seat and fasten the straps. Tighten the straps until you can no longer pinch any of the harness webbing with your thumb and forefinger. The safest bet is to just take any coat in question off, and drape it over them after they are strapped in. Or, alternatively bring a blanket to do the same thing. 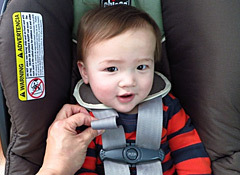 If the straps have any extra lag, your child is more susceptible to being ejected from the seat during a crash. This advice even extends to adults. Do not wear bulky coats when driving as it limits range of motion, and prevents you from being strapped in securely. Read more about car seat safety here. Injured in a car accident? Call Attorney Mike Hancock with Hancock Injury Attorneys for a free consultation at 813.915.1110!